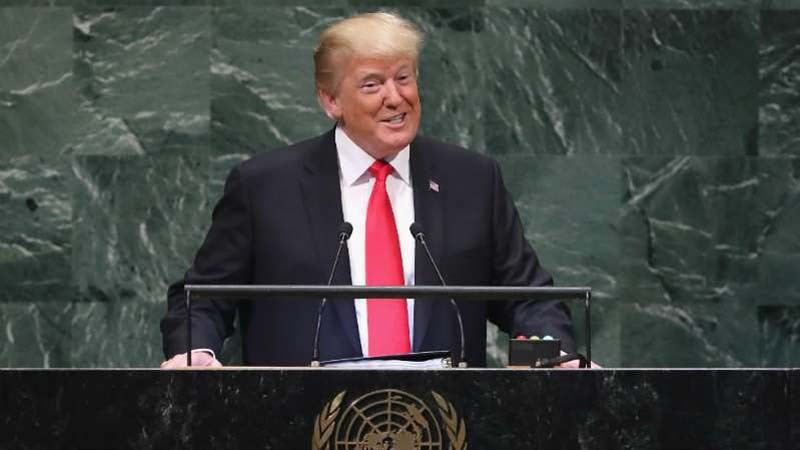 President Trump on Wednesday said that while world leaders laughed during his speech to the United Nations the day before, they "weren't laughing at me, they were laughing with me." "We had fun. That was not laughing at me," Trump told reporters during a press conference. "So, the fake news said 'people laughed at President Trump,' " he added. "They didn't laugh at me. People had a good time with me. We were doing it together." During the opening remarks of his speech on Tuesday, Trump boasted that his administration "has accomplished more than almost any administration in the history of our country in its first two years." Audience members began chuckling, and the laughs grew louder when Trump said "so true." Trump smiled and paused, before adding, "I didn't expect that reaction, but that's OK."
Trump said Wednesday that he was surprised by the response because many of the people in attendance "aren't big into clapping, applauding, smiling." He suggested that the reaction was a sign of respect. "They respect what I've done," he said. "The United States is respected again." Trump's comments echoed those of U.S. Ambassador to the United Nations Nikki Haley, who said Wednesday morning that the laughter was an indication that world leaders appreciate Trump's honesty.